Screenshot of Night School promo video. Currently, Night School has a limited offer rate of one month of rides for $10 which folks can access by downloading the app. Night School is not licensed to accept payments on a per-ride basis, though the company says on its website that this will change soon. After the $10 kickoff deal expires, riders will pay $19 per month to access the service. Each bus has a driver and a Night School "conductor" who will supervise the boarding process and "maintain a comfortable and safe environment for all riders." No drinking on the bus! 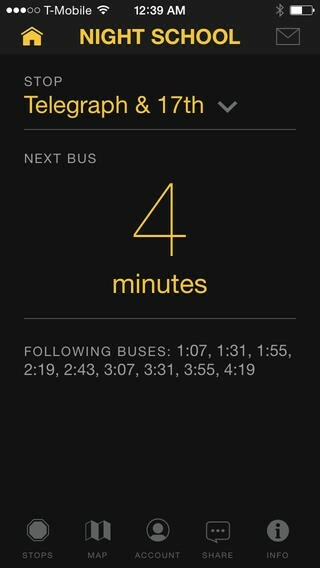 The app tracks the bus and also connects with the conductor via Bluetooth to expedite boarding. Seating is first come, first served. Currently, AC Transit does operate the all-nighter 800 bus that runs from 1 a.m. to 5 a.m. from Market Street and Van Ness Avenue in San Francisco to Richmond BART, with about a dozen stops along the way. Night School plans to add more stops to its route in the future.